The annual Mary Day get-to-gather on August 15 and Mother Mary's call for a Conclave for Peace (Aug 14 & 15) have come to a close this year. We had people come from all over: one man came from Canada, one couple came from New York, several from California, Minnesota, Ohio, Tennessee, Alabama, and of course: Texas, Arkansas, Missouri and Oklahoma (I'm sorry if I missed any state represented). This year we were also honored by the attendance of Jean Foster, author of The God-Mind Connection and her acquaintance Connie, both from Missouri. Saturday morning we gathered in our home to hold the Conclave for Peace, and it was wonderful to have the participation of the group. Most of those who attended are working on becoming peaceful from the inside out. Many of the group are working to bring not only peace, but the gift of love to their family and community. We ended the morning with a circle of peace, which was formed in our front yard. Our property sits on a mountain ridge and has such a wonderful, peaceful atmosphere. It seemed right to have our prayer time in a circle, nested in this beautiful environment. The afternoon was a time of eating, getting to know each other and was a more informal time. One lovely lady brought her portable table and gave Reiki treatments to as many as she could. Since I (Annie) was never given an agenda of what was to happen, we simply went with the flow and enjoyed our time together. What I've learned is that it's not so much what words are used, although words are very important, it's the intention that counts the most. Our intention was to gather for peace. To come together to hold the thought of peace in our lives, in our homes and in our world. We agreed that once you make the decision and speak your intention to live in peace, all that is not peaceful in your life will surface to be eliminated. Many of us had very personal experiences to share. We ate dinner together at a local restaurant and had a time of deep enjoyment, laughs, and a coming to know each other in a very personal way. I'm not sure the restaurant will ever be the same, we hope we left some joy and pleasure there. After dinner a handful returned to our home to have an intimate time with Jean Foster and Connie, her friend. I'm very grateful to Jean for joining us this year. Since I've considered her one of my role models, it was a honor to have her with us. Sunday morning we held our "Family Meeting" style meditation so those attending can see how we meet on Sundays (almost every week). Afterwards we just enjoyed talking with everyone and sharing experiences. 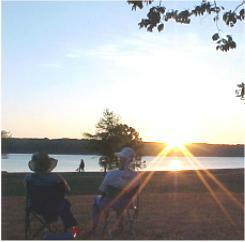 That afternoon we broke up and rejoined at Lake Tenkiller for the yearly August 15th, Mary Day get-to-gather. As usual, we started with a pot-luck supper. Then Annie went aside to get quiet. When she rejoined the group, we arranged our camping stairs, stools, and blankets and looked across the lake generally to the sun. About 7 PM most people had noticed the sun spinning. About 8:30 PM the sun went down and we gathered in a circle and sang Amazing Grace and Let There Be Peace. On August 15, 1999 at Lake Tenkiller a group including myself experienced the presence of Mary in different ways. What I experienced was once again, the standing Madonna form in deep blue with pink all around it. Later, as the sun was setting, I saw the Blessed Mother in a cameo. All the while I was experiencing auditory messages. The one that I am to impart to all people is Her request that on the 15th of every month at sunset, we pray the one for the other. And that we pray for all the people in the world. There was a message I forgot to tell the people who were there that day. That I had forgotten concerned me, until I realized that maybe it was not an oversight. The Blessed Mother said that all people who gathered on that date with the intention of answering Her request to pray for peace, would receive individual revelations. Mary said not to try to guess how or what these revelations would be, that they would come as an insight, an idea, or as advise or suggestions. There was a man who dropped into our home as we were finishing lunch. He said, "I'm not suppose to be here. I'm on my way to Georgia from California. But as I got near, I just knew that I had to be here. It was my wife who wanted to come." After we had finished at the lake and we were leaving, he came to me and said, "I got my message. I know why I was suppose to be here." He seemed very relieved. One other lady who has been with us every year and was not able to come due to surgery, called and said, I saw pink in the sky and felt down in my gut with a deep knowingness, that I would be healed. So without me telling anyone, people were receiving their revelations. It is so wonderfully confirming to me when it happens like this. Besides our group here in Oklahoma, the Mother Mary Circle from Grants Pass, Oregon held their Conclave for Peace. And one gentleman from Brazil notified me via email that he would be joining us in prayer. And of course there are undoubtedly others around the country and the world that also joined in. Because of my daughter's flight back to Bosnia, we were not able to come on Sunday. I was disappointed because I wanted so much for her to have the experience. We were actually driving back into Tulsa at dusk and I was saying a prayer for my friend Linda, who has been told by the doctors that she has cancer, when I noticed that the sun seemed to have a violet disk over it. Then it started spinning with gold and pink, blue, violet. My daughter was watching the whole thing too. Then the outline of Mary appeared over and around the Sun. It was the greatest blessing we could have had. My daughter, Leesa, and I felt this great gentle peace. As it turns out, my friend Linda was thinking about Mary at that same time and was also filled with a grace and peace. There aren't any words to describe how grateful I feel to Mary for that special blessing and to you for making me aware of the possibilities of August 15th. "My children, be of good cheer, much will need to be done--do not be afraid, for we are with you and will not forsake you. Resources will be available if you only believe. Remember what Jesus said, "Have faith as the grain of the mustard seed." Many will be distraught and have trouble in control--others will make their transition. The chosen ones will be needed greatly to help through these troubled times. Pray, meditate, and love all you come in contact with and those you don't. Jean said that as the sun was nearing the horizon, which was covered with trees, the pink changed to a brilliant purple and sun became black. A reader of the Mary's Message books that joined us for our Mary Day get-to-gather, has created a "Friends of Mary" club on the Internet. If you are interested click on http://clubs.yahoo.com, then select "Religion and Beliefs", then "Spirituality", then find (Search for) "Friends of Mary". Or you can email him at: fledgling1@hotmail.com for more information.